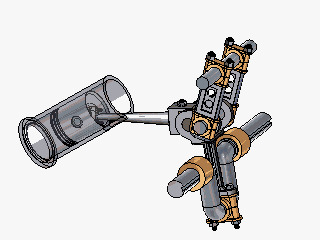 Crank shaft is main rotating parts of engine, is installed on the connecting rod, can undertake the (reciprocating) up and down movement into circulation movement (rotation) of connecting rod. Is an important part on the engine, and its material is made of carbon steel or nodular cast iron, there are two important parts of crankshaft: main journal, connecting rod journal, (and other). Main journal is installed on the cylinder block, connecting rod connected with the big hole, neck connecting rod small hole is connected to the cylinder piston, is a typical slider-crank mechanism.Lubrication of the crankshaft is mainly refers to the lubrication of bearing between the rocker arms and the lubrication of two fixed point. The rotation of the crankshaft is the power source of the engine. Is also the driving force of the whole mechanical system. Crankshaft fracture is the serious fault of the engine, and fracture usually occurred in the postions of connecting round corners between crank pin, main journal and the crank arm or other stress concentrated sections, like journal oil hole position. 1.Individual users due to improper selection of engine oil, or do not pay attention cleaning and replacement, oil long-term use of metamorphism; Serious overloading, super hung, causing engine overload operation for a long time and appear the tile burning failure. Because of tile burning, engine crankshaft is resulted in serious wear and tear. Users could choose to repair damaged crankshaft for standby application, and buy a new one installed. Some users consider more about cost and time, will find a small factory in the local to repair, will seriously do surfacing welding, processing, whole heat treatment and grinding on the serious wear section of the crankshaft. Due to repair methods and process problems, changes will be caused at the connecting round corner of crank pin, main journal and crank armround, causing local stress concentration. As the crankshaft is made of 45# steel with closed die forging, surfacing welding will also make metallographic texture changed. So above two factors will cause second fracture of crankshaft. 2.After reparing of engine, overload ultra hang without passing run-in period and overload woking for a long time, will make overload of crankshaft beyond allowable limit. 3.In the repair of crankshaft adopts surfacing welding, destroyed the dynamic balance of crankshaft, nor do the balance calibration,causing the big vibration of the engine,lead to fracture of the crankshaft. 4.Due to the poor road conditions,serious overload ultra hang,also causes the crankshaft torsional vibration fatigue failure and fracture. Crankshaft is one of the key components of automobile engine, the performance good or bad will directly affect the service life of the car. Crankshaft is working under heavy load and continious changable bending moment and torsion moment, common failure modes are the bending fatigue fracture and journal wear. Therefore, requires the material crankshaft with high rigidity, fatigue strength and good wear resistance. With the development of the spheroidal graphite cast iron technology, its performance has been improved, qualified and cheap ductile iron has become one of important materials to make the cast crankshaft. Since the invention of nodular cast iron in 1947, through the efforts of long time,the tensile strength increased to 600 ~ 900 mpa, approach or exceed the level of carbon steel. Compared with forging steel materials, nodular cast iron crankshaft not only has the characteristics of simple manufacture simple and low cost, but also shock absorption, abrasion resistance and is not sensitive to surface crack. For high grade materials like QT800, QT900 for cast crankshaft, many cast crankshaft manufacturers also have done a lot of research experiments including alloying research is not all, often need to combine the size of the crankshaft and using iron mould coated sand, shell mold casting process such as filling pill to achieve together, and the molding process in the production of QT600, QT700 brand of the crankshaft and camshaft has a large number of applications, and become a development trend. For forged crankshaft, bar as a blank, the parting surface selection should consider the convenience of the mold and adopt symmetrical linear parting. In order to not produce fold when forming, drop forging manufacturers should add a roll process before bending; The accuracy of turn will directly affect the control of the CAM movement, in order to ensure the quality of forming parts, plus a preforging in advance before finish forging sequence. Because of the closed die forging can produce burrs, finally carries on the trimming. For assembling requirement of two head shaft, so the forged crankshaft will be machine after drop forging. 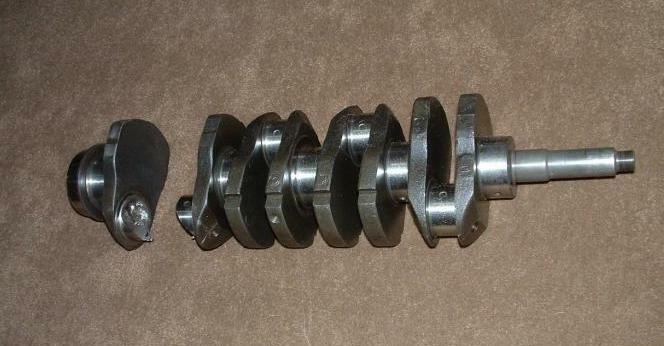 a.use less or no oxidation heating billet, cooling forged crankshafts in the anti-oxidation medium, in order to prevent the secondary oxidation. b.use trimming correction compound die, reduce trimming deformation of forged crankshaft key sections. c.strict control of mold temperature, mold hardness, lubrication conditions,ect. Thus to extend mould wear failure cycle. Cast crankshafe is one-time shaping process, while forged crankshaft need to be forged many times. And further heat treatment processes are also not the same. From the side of internal organization,the performance of forged crankshaft is more stable than that of cast ctankshaft. Cast crankshafts will have a series of defects, like sand holes, loose, segregation, ect; By contrast, the internal grain of forged crankshaft is uniform, eliminate raw material defect and tissue defect and so on. So the biggest difference between cast and forged crankshaft is that we can achieve better internal structure and reduce crankshaft fracture. We are the rich-experienced manufacturer of forged crankshafts in different sizes. And we can custom forged crankshaft in any materials (how to select materials for forged crankshaft), our technical team will also give you our suggestions to make your parts perfect. Just contact us for your forged crankshaft needs. this is Rrza from Norouzi Co.
could you offer me or not ? How do we determine a fake Forged crankshaft since there are many manufacturers of fake materials in our time?